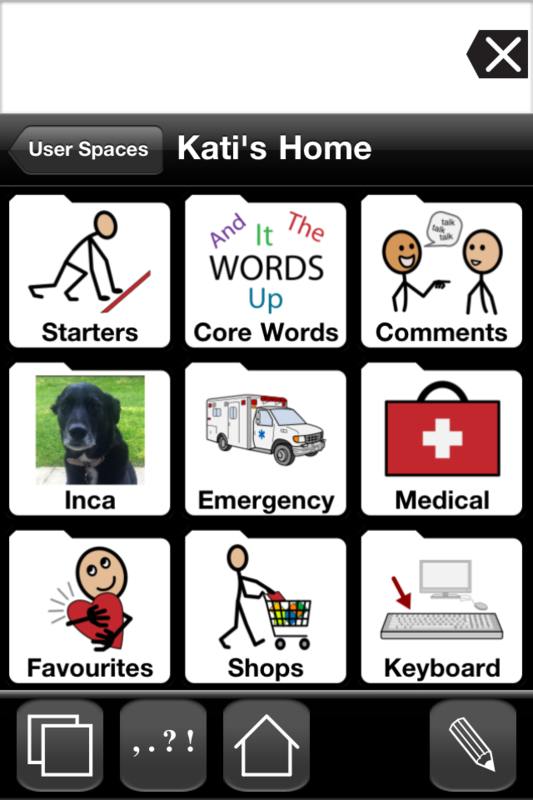 Yesterday I had a home demo of the Invacare TDX SP. From the video clip it looked really good, although I had heard it was only available in Red in the UK for some reason. I thought I’d probably be able to get custom colour though and thinking this was the most likely MWD the NHS would have in mind for me with Invacare been their official supplier. I wanted to try it at home first, as when you pass the driving test for powerchair with NHS, you have to go back to the clinic again to try out some chairs which I felt didn’t tell me whether it would fit through the swing gate or through the A frame thingy at the end of our estate. I was disappointed at first the man hadn’t brought one with the flip up footplates as requested on the phone (though apparently this was not the person I’d talked to on the phone). I was envisaging having to faff about removing the swing away legrests to get through the gate, but surprisingly I didn’t need to. As the chair turns in its own axis I just went in diagonally, swung the back end round behind me so the man could move gate across then moved front end out sideways till I could drive straight out. Brilliant!! the chair turns on a dime! Next I tested it out on the bumpiest path I was worried with the little castors front and back I’d get stuck but the frame is not fixed. It’s hard to explain but the front castors can move upwards or downwards from centre point by about 3″ (the centre point been a completely level surface) so when it hits a small bump the front castors simply lift up and over, this means it can also climb small kerbs without needing a Kerbclimber. 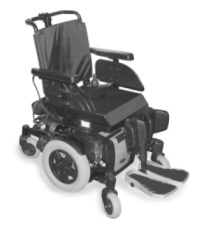 It easily handled the slopes due to the stability lock which keeps all 6 wheels in contact with the ground and the castors abilities to go up or drop down 3″ from level position. I even went up a steep gravel slope thats opposite my home which I wouldn’t have dared attempt in the Vibe as that wheelies just going over the speed bumps in the road! It was much easier to keep in a straight line even when I did the max speed down the hill which I think he said was set about 6.5mph. On the Genie I could only keep it straight on lower speed with back castors locked so they didnt spin as fast, but it still ‘fish tailed’ when I went up to 4mph which was the top speed on that. When we first tried through the A frame, the arm rests were getting wedged as I was having to go in at angle to stop the controller getting scuffed, the one he had on was quite large. After he altered arm rests with an allan key and pushed them in as far as they would go I got through very carefully. I will choose a smaller controller when I get mine and also mine will be lower down so the T bar is level with top of arm rest so my hand/arm has support all the way along. This should also then make it easier to get through there. As the man had only brought a standard joystick I had to put my big foam ball on top so the controller/joystick did seem quite huge and was fixed (not swingaway) so some improvements could be made there. Indoors it easily made it through the 90 degree angle between the lounge and bedroom doors and the seat riser function would be a great help around the house for hanging laundry out and reach into cupboards. In the picture above I still had the leg rests on and managed to get into the nearest cupboard to me, with them removed I’d be able to get even closer to the washing machine to reach stuff from the other side. The legrests are a good angle they don’t seem to stick out as much as on the Vibe and you can alter the angle your legs are at so they can be straight down or more raised if you need them to be. The man said central footposts are not as comfortable when you need to be in a chair for a long time and the flip up footplates stick out much further in front. Also other colours are now been introduced as standard over here and Black was mentioned which I like. This pic shows it with black frame and the seperate flip up footplates which do look like they would stick out more. As I easily got through the swing gate with the standard swing away leg rests in place and the angle is more adjustable I might stick with the standard ones. The difference between the tilt and reclining backrest is Tilt moves the whole seat back so your legs are also angled. The reclining backrest feature only moves the back of the chair. Apparently there is a manual back recline but the man said it didnt work as the electric one had been put on this demo model. so I’d have to ask about that at the clinic. As he hadn’t put an head rest on I couldn’t tilt it really back to try resting position as there was no support behind my neck/head. He also didn’t seem to know how much it was for a custom colour and when the new colours would be standard (I’m guessing they will add blue, black, lime green.. same as US already has) so it depends on how much they would charge and whether black was available as standard by the time I got to ordering mine. Still my contribution would be under £2,000 if the NHS would agree this is the right chair for me instead of the full cost which he estimated at around £6,500 for the features I wanted/needed on it! It will cost more than the Genie which stands but that had a few issues that worried me, the only thing worrying me about this chair is whether I can get it in black or pink! I am thinking of going down the route of seperate chair and standing frame rather than standing chair. As, if NHS cover most of the cost of the TDX and I can drop on a second hand or ex-demo standing frame (so can do an hour a day standing) it will be considerably cheaper for me than having to foot bill for most of the Genie as the NHS would not fund that. So my next step whilst I am waiting, is to look into some frames that will hold me up in standing position for at least half an hour (have two sessions) and still have use of my arms to play on wii or paint etc whilst standing. 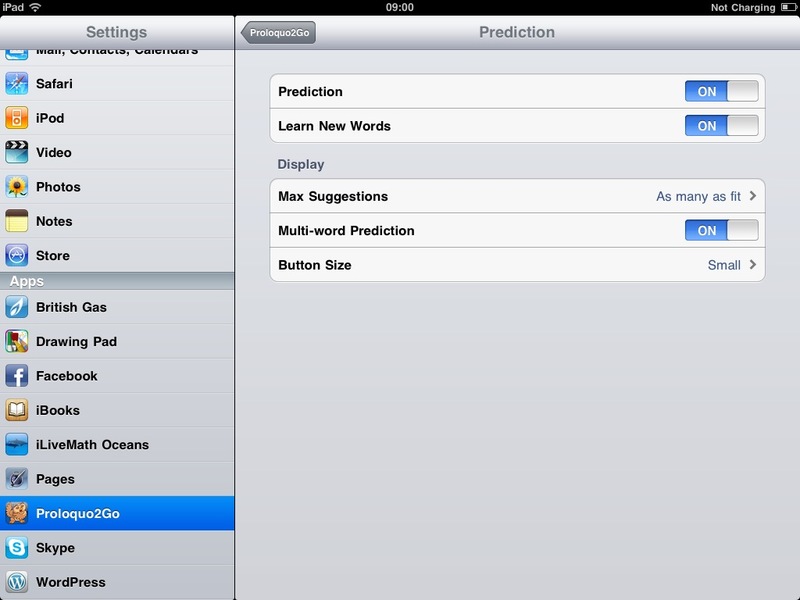 I was thrilled to have opportunity to Beta Test this latest update of Proloquo2Go with the word prediction system. Any users of Keystrokes for Mac’s will recognise the way it works instantly and as I already have been using Keystrokes for a few years now I kinda had a feeling this was going to good if it was based on that system! 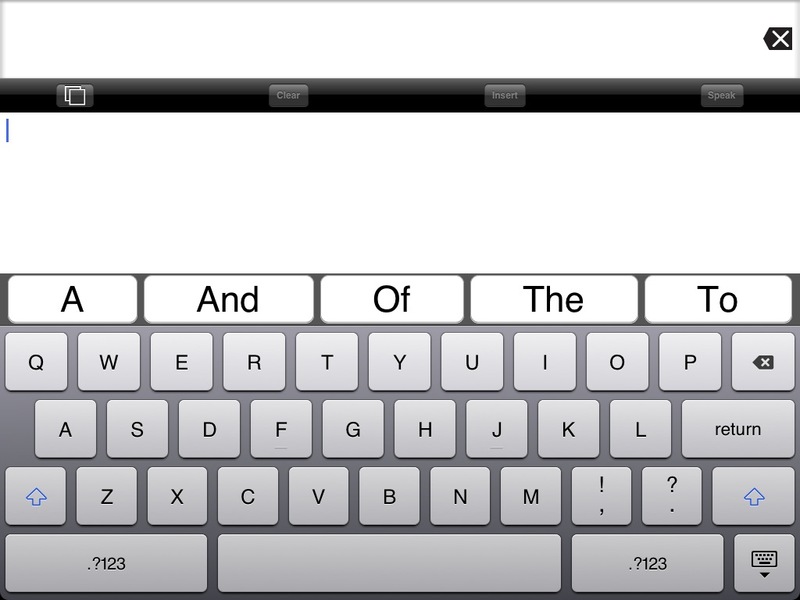 The word prediction bar sits on top of the qwerty keyboard (when you go into keyboard within P2G app) and simply offers predictions as you type. You can choose to have as many or as few predictions as you want on it. Obviously more predictions will make each selection a little smaller so if you do have issues with dexterity you might find it easier to have fewer options. A child who is still learning to read might also find it less confusing if you choose to have fewer options. Turning the option on to learn, speeds things up. If you choose Multi Word predictions in the settings it will predict middles or entire ends of sentences as in the example above. So if you are using the keyboard as your main communication method and just using the grid for pre-stored information such as about yourself, medical info etc then using the keyboard then becomes a lot more efficient. If I had already typed ‘I was in the bath when she called. ‘ the next time I started a sentence with I, I also got these included. If you didn’t want that exact sentence you would get different choice by pressing ‘in’ or ‘in the’ rather than ‘in the bath’ on the first screen. Note it is the punctuation that helps it learn the sentence so if that was a one off sentence I didn’t want it to learn I might just type it without the full stop then speak it, whereas if it’s a sentence I might say often such as ‘My dog’s name is Inca.’ if I make sure I add the full stop at end the first time I type it, it will learn it. If like me you have combination of memory issues and difficulty with co-ordination you may find it easier to spend some time putting sentences in with full stops at end so it will learn your most used sentences and selecting to have fewer predictions. 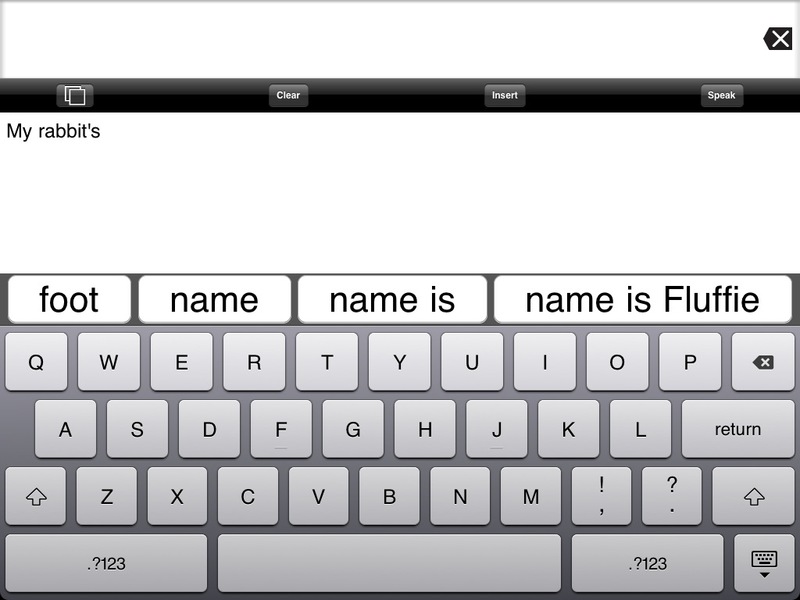 If its for a child you could put family/pet’s names in with the full stop after and it will predict. You might want to use this feature to improve literacy skills if your child is able to move on from selecting a symbol to represent a sentence. so may type ‘my rabbit’s name is Fluffie. (don’t forget the full stop!) 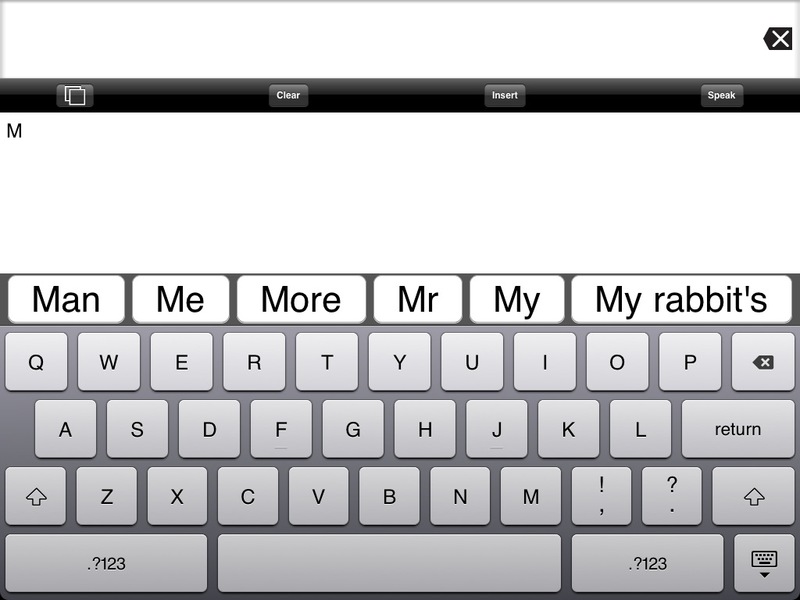 so when the child selects ‘M’, then ‘My rabbit’s’ should appear in the next prediction, if they select that then ‘name is Fluffie’ should come up etc. Because Proloquo2go does not just learn individual words, but also word combinations it learns each time you use some punctuation such as comma, period, question mark, etc. I only typed in each sentence ONCE, as long as you remember to put the punctuation on the end if you want it to ‘learn’ it, it will come up the next time you try to type the sentence in. This is an handy feature for a parent who can put the sentences in first ensure that prediction will come up before the child uses the keyboard. Even typing in general, words for a sentence that you may only type once, the prediction works well, there is logical choice of words that usually follow each other in sentences. The Word completion feature built into Apple’s devices still continues to work so between them both you get a very effective system, even if like me you prefer fewer predictions and larger ‘buttons’. On the iPad version the prediction works in both portrait and landscape mode, but on iPhone/iPod Touch in portrait mode only due to lack of space in landscape on the smaller screen. 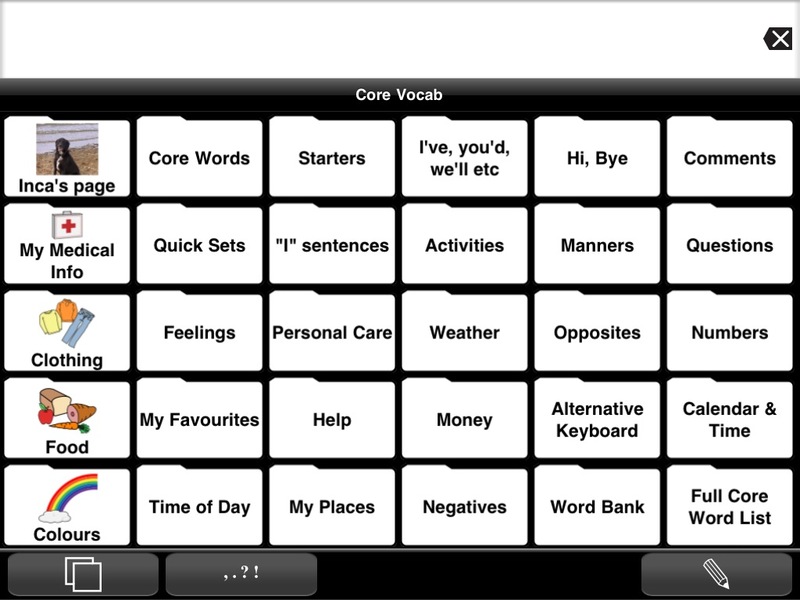 The only thing is It doesn’t speak word for word as you type into the larger box, unless you sent it into the box above after each word, so a child used to getting verbal feedback after each selection might still prefer to select words from within the grid system. Overall its an excellent addition to Proloquo2go and my favourite update so far!! 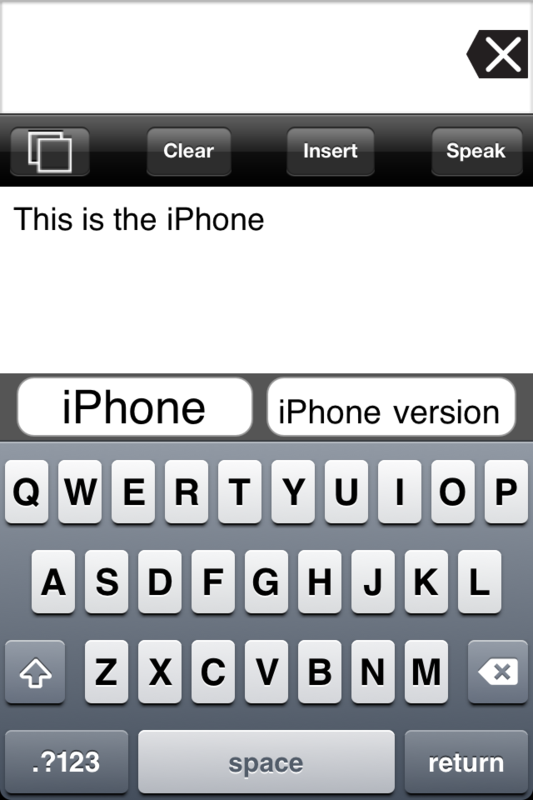 **UPDATE** – It is now possible to create shortcuts via iOS menu, which will expand in Proloquo2Go now. 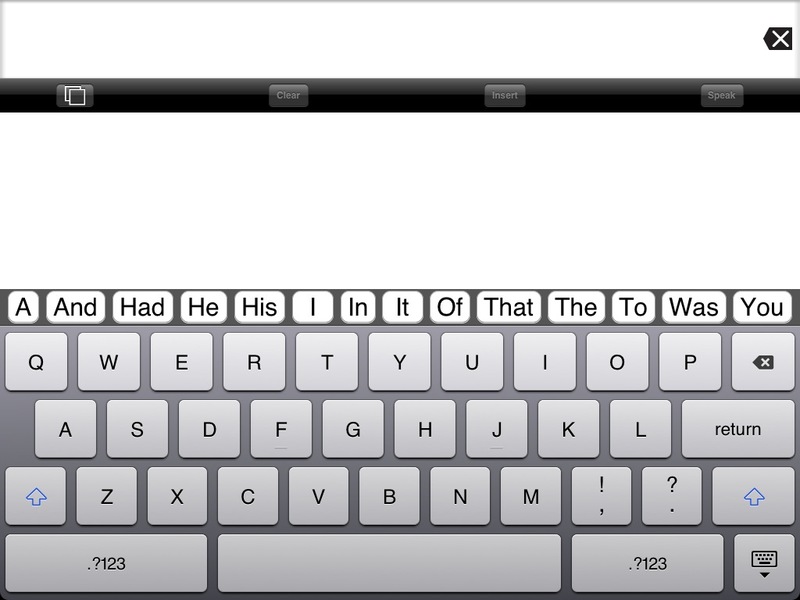 You can also choose to speak each word as you type it in typing mode now. I have had my iPad nearly a year now and both my fine motor skills and short term memory have improved to different degrees. For those of you that don’t know, I have a rare form of Ataxia which includes extra involuntary muscle movements other than the usual intention tremor, so even at resting my hands and arms will move even when I wasn’t consciously trying to move them. Intentional movement does make them more jerky so for example if I stretched arm out to reach something a few feet in front of me I might overshoot the target, undershoot it or hit it exactly and send it flying! (the medical term for this is Dysmetria). on top of that when you manage to grab or grip the thing I also get an intention tremor especially if its something small (like a pen) or heavy. As you may be able to imagine this can make things like typing and using iPhones etc quite a challenge! I have however discovered a few little tricks along the way, mainly taught to me by online friends who have lived with similar difficulties much longer. although I do feel these kinds of things should be taught to you by physio’s etc when you are diagnosed with such a condition rather than been left to figure things out yourself!! When I got my iPad I wasn’t entirely sure how much use I’d get from it. I knew I could manage Proloquo2go as within the app you can make the buttons as large as you need them to be and I knew I could manage typing in landscape mode cos of size of keyboard, that was about it. I didn’t know it was going to be such a large part of my daily life. 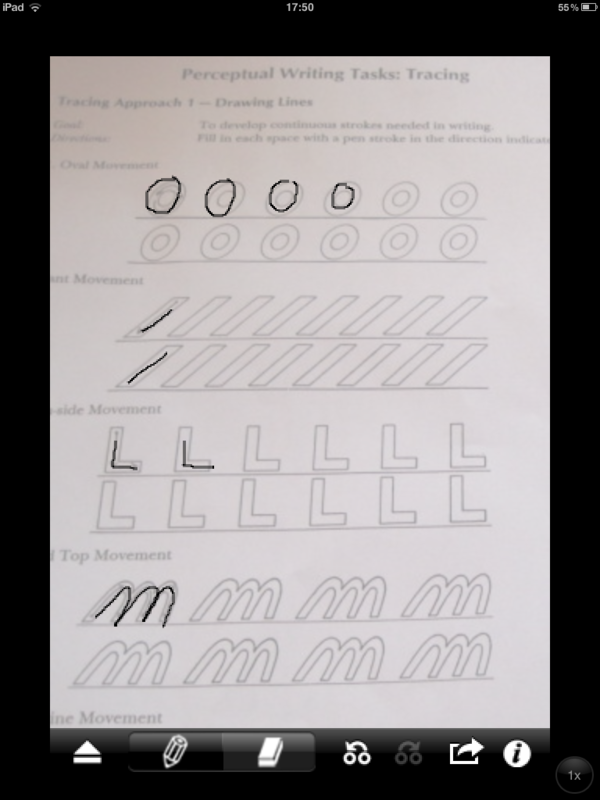 Finger Co-ordination (involving tracing or dragging objects to specific point) : Drawing Pad, Art n Trace, Angry Birds, Art Studio, Scrabble, Lexulous, Words with Friends, Bejeweled 2, Tangram Pro, Blue Block, Word Search, Slide It. 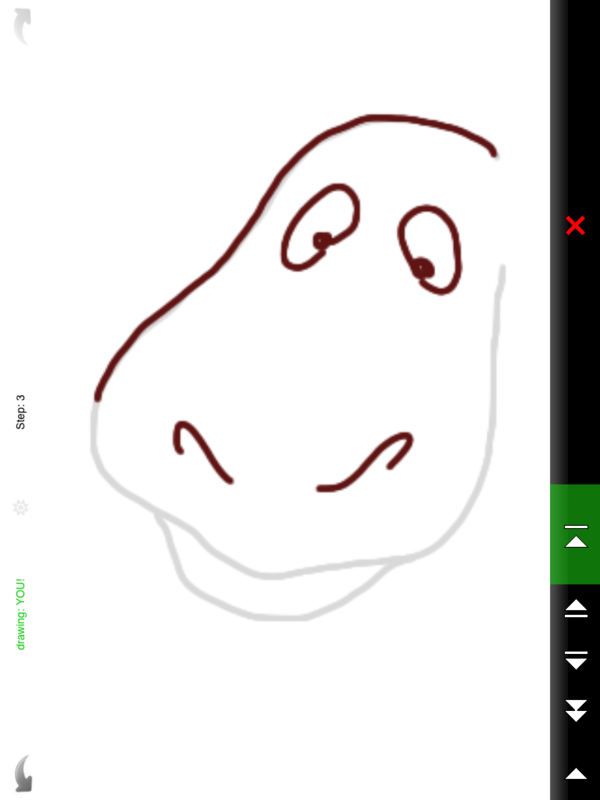 The Drawing Pad app has a lessons feature, it draws a grey line and you trace over it with your finger to make the picture.. good for practising finger control. 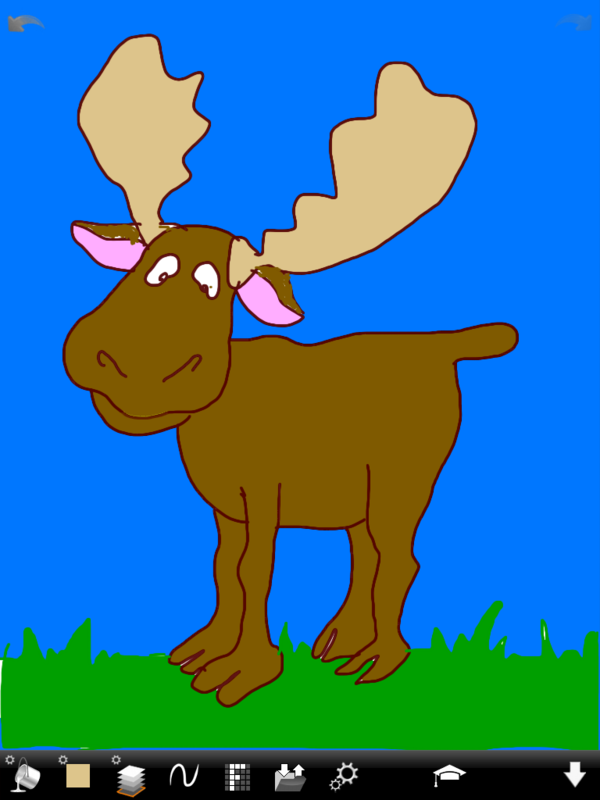 I also used Art n Trace which can use any photo to trace. I used it with some writing exercises. First press camera icon to find picture you want to use then press the icon next to it (left photo) resembling a pencil and paper and your picture is covered with a virtual sheet of tracing paper (right) for you to copy the drawing/shapes. These could also be used for developing mouthstick skills as well as preserving finger control and hand co-ordination. Another main area was my memory. When I first downloaded Proloquo2go it was really slow to communicate with because I struggled to remember which category to find each word in. I got around this by creating my own pages from scratch for the specific situations I would use it. I always wanted it to get word prediction as at that time I could use the Lightwriter quicker where I just had to press one or two letters and the prediction would appear. However I have found over the year my memory has improved and I find myself quickly moving between my own home page and the original one and knowing where I need to go to find the next word. Other games I have used for memory are ‘Simon’ and matching pairs type games. I recently added a few adventure style games to iPad which I had previously stopped playing, as by the time I got chance to go back on them I couldn’t remember where I had got up to. 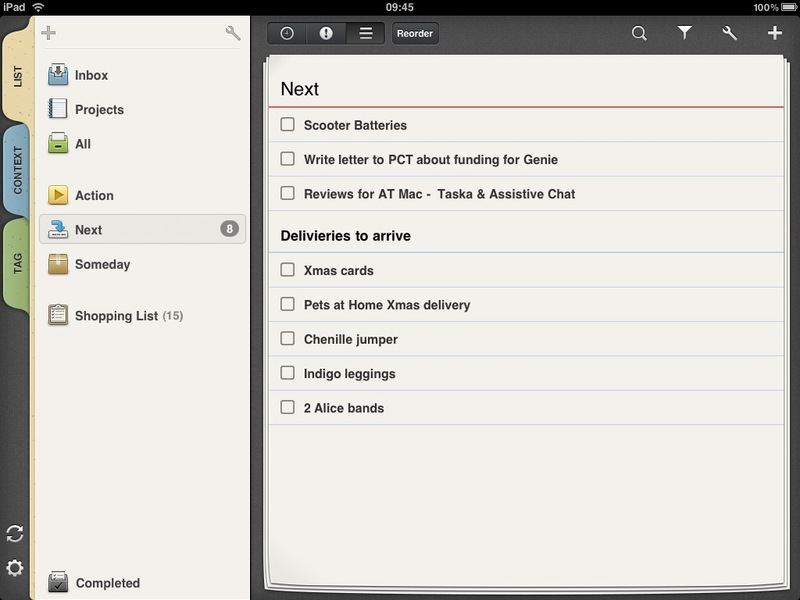 Another app I love and has helped with memory and organising my day and activities myself is ‘Taska’ for iPad where you simply create lists that you tick off when you have done it. An added bonus from been inspired to practice on the iPad everyday is I can now also manage a few apps on an iPhone. Although the screen is much smaller my biggest issue was been able to text from it and use it as phone! 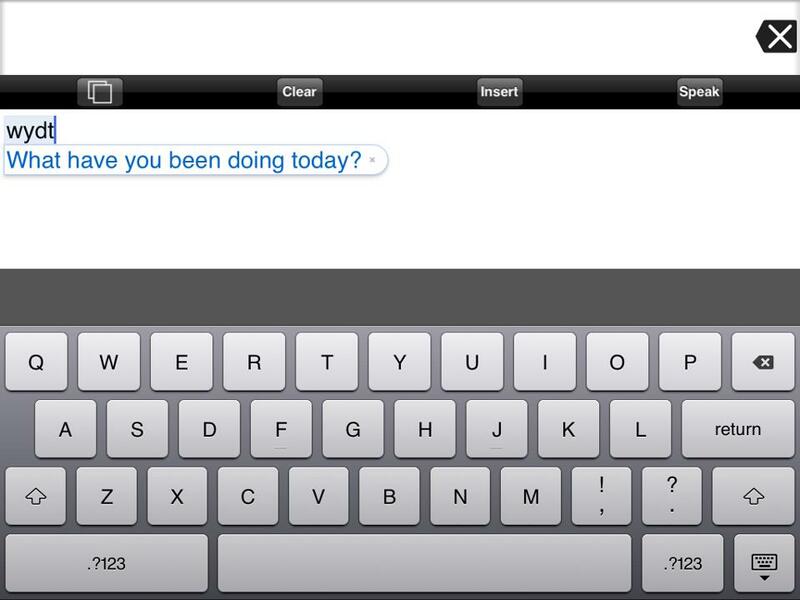 With the Tikinotes app which reduces a standard qwerty keyboard to 6 buttons and provides word prediction, I can compose my messages easily on that and send it to SMS. 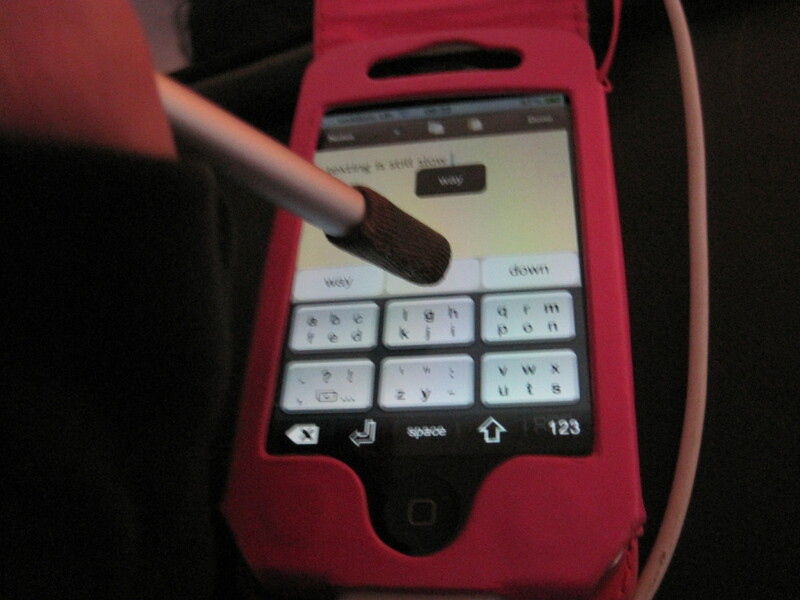 I find it easier to use the iPhone with the adapted T-bar stylus. I found if I hold my arm upside down (using weight of other arm on it too) and position the T bar so it goes down from middle of fingers I have more control. This makes texting manageable when my iPhone is not in the iMainGo case because its on charge or I wanted to use the photo/video features of the phone. All these things have helped in other area’s too for example control over arms for doing other jobs around the house and also with using the Wii and just managing things as simple as been able to make myself a drink of Tea without pouring boiling water over myself or get myself dressed. I’d given up on wearing laced shoes and have loads of pull on tracksuit pants and fleeces and things that don’t need fastening as it was getting such a struggle. I had gadgets for all types of fastenings but the best thing I have got out of using my iPad and iPhone is better control over my movements enabling me to remain independant for longer. I would recommend it for other Ataxians especially if you need occasional help with speech now and again but don’t want to have to find thousands for dedicated devices or carry around a PC device and wait for windows to start and your anti-virus to update before you can get your sentence out! 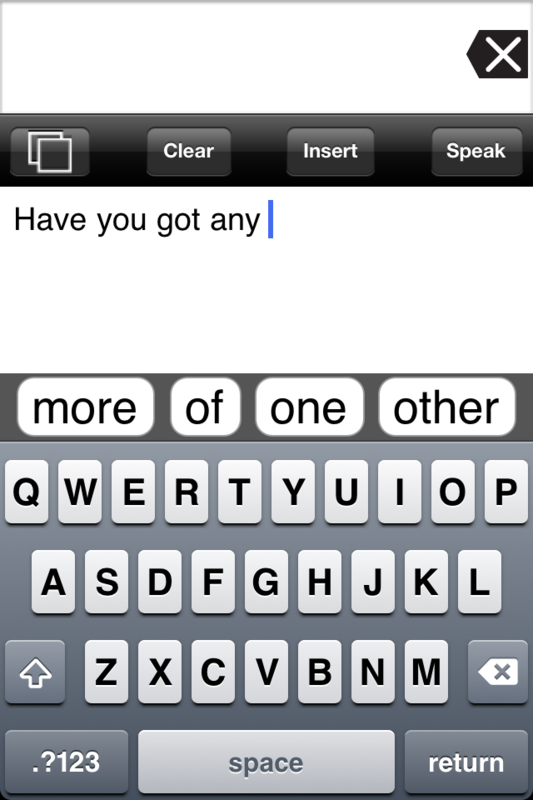 There are many speech apps ranging from very simple type and speak for £1.19, with a simple word prediction for £14.99 or more extensive AAC apps for around the £100 mark. It depends what you need from it. Proloquo2go is the most customisable one at the moment with more features been added it can easily match the £5-7,000 devices for communication. The thing I love about Proloquo2go is you can make it your own. 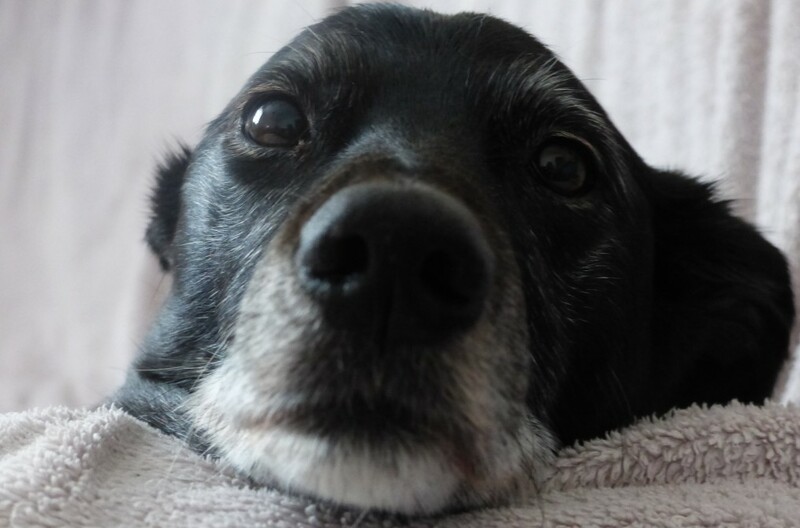 I originally chose this one as I knew I wanted to be able to use it on an iPhone, as I don’t want to have to carry a larger device with me when I take my dog out just in case I need to ask where they moved the eggs to or what time the milk delivery is coming if I call in the shops. So whilst my iPad is set up with much longer conversations in mind for things like appointments with doctors, etc who only see you once and you need to explain quite a lot, my iPhone is set up just for things I might need to say if I want to nip down to Asda for light bulbs or whatever else I might need. And just in case I run into an old neighbour who knew my family (and is having difficulty understanding me) I have a category within starters to tell people what I/we have been up to since they last saw us! I also use the bar scanning app to add groceries to my online basket the switch to computer to put it through, you can send entire order through on app but it involves been able to use the built-in iphone qwerty keyboard. 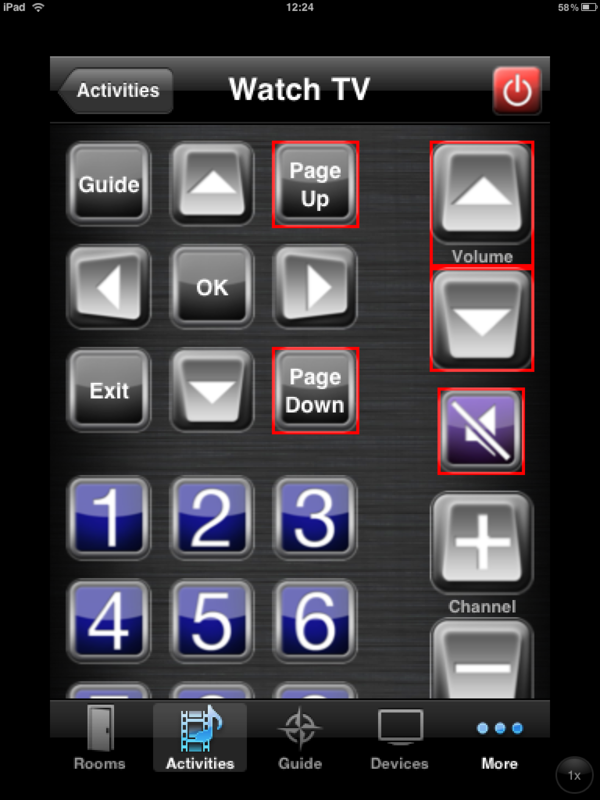 As well as using the Red-Eye remote app to create jumbo touchscreen TV remotes. Were they worth the money? a resounding YES from me! !